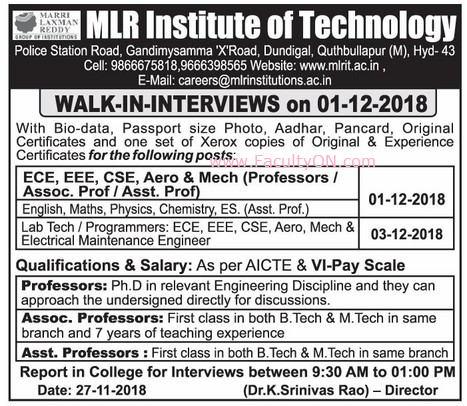 MLR Institute of Technology, Hyderabad has advertised for recruitment of Teaching Faculty- Professor / Associate Professor / Assistant Professor Plus Non-Faculty jobs vacancies. Interested and eligible job aspirants are requested to walk-in on 01st December 2018 for teaching faculty posts and 03rd December 2018 for non-teaching posts. Check out further more details below. Professors: Ph.D in relevant engineering department. They can approach directly to the Director for discussions.